Angelo Poffo started off life wanting to be a baseball star making his way to the DePaul University team as a catcher. He stated himself that his catching was very good, but his hitting was not so good. Unfortunately for Poffo he was struck by a baseball during a game and from there he gto some-what plate-shy forcing him to give up the dream of making it big in the NBA. With no idea of where his life was going to take him, Poffo joined the US Navy where he set a world record in sit-ups. In four hours, ten minutes he performed 6,033 sit-ups claiming, "Somebody did about 5,000 and his abdominal aorta broke and he died. So, I did 6,000 and I was so happy that I was still alive, I did 33 more sit-ups, one for each year of Jesus Christ's life." So impressive was Poffo's performance it was featured in the famed Ripley's Believe It Or Not cartoon. After serving his time in the Navy Poffo headed back to Illinois where he joined a local gym run by Karl Pojello and attended by Ruffy Silverstein. Angelo remembered that his first opponent was Ruffy in 1949, however, the first recorded match I can find for him took place on September 27, 1949, at the Shrine Temple in Rockford, Illinois, against Danno McDonald in a winning effort. During his first couple of years he experimented working as a manager under the name of the Miser, a character called the Masked Miser who wrestled, he also used the alias Tony Angelo or Andy Angelo while working down south in New Mexico. His work across this period of time was also heavily inspired by Roy Shire. A good bump-man, Poffo was proud of his style of hit-and-run wrestling during his first heel run, the hatred from the fans at his tactics only multiplied when he was teamed with Bronco Lubich as his manager. Bronco from time-to-time teamed up with Poffo and the two even won tag-team gold together. "Poffo is always accompanied to the ringside by his manager-adviser Bronco Lubich, who appears in a tuxedo and carrying a cane. He coaches his protégé from a ringside location. 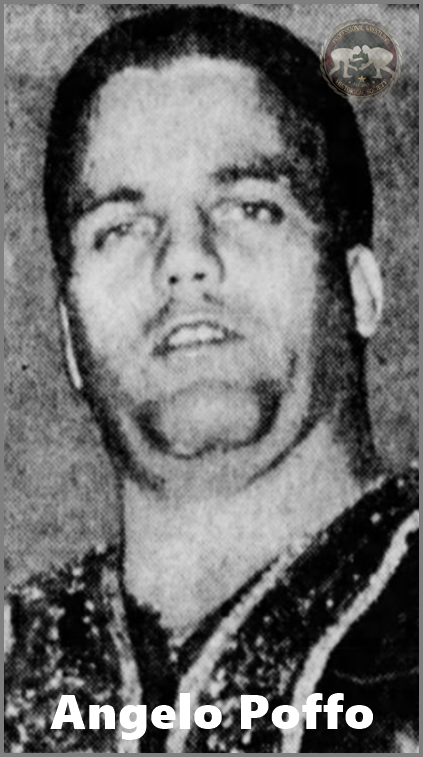 Lubich was once a wrestler and a rough one and for that reason he urges Poffo to become as unruly as his opponent when the occasion calls for it. Poffo has created an Italian neckbreaker hold that is devastating and if clamped on properly can be a grueling grip to the opponent. In fact if Poffo's hold is used on Hans and the latter does not concede the fall in short order, Schmidt will be in danger of being hospitalized." On December 27, 1958 Angelo Poffo won the United States Television Championship from Wilbur Snyder in Ohio. The two had many rematches after this over the coveted belt in that region with Angelo successfully defending the title for nearly months when he eventually succumbed to Wilbur Snyders efforts and relinquished the belt on May 2, 1959 at the Olympia in Detroit, Michigan. It appears from this point on Angelo just worked exclusively in the Northeast of America, even confronting Bruno Sammartino on his rounds, until the latter part of 1963 when he moved to the Central States and St. Louis areas. By 1966 Poffo found himself in a tag team with Chris Markoff known as the Devil's Duo, the two wrestled in the WWA winning tag team gold there, whilst managed by Bobby Heenan. By 1973 Angelo had moved on to a new team mate in Ken Dillinger, they were known as the Graduates. This wouldn't last too long though as Poffo started to wind down his career. He is quoted as saying, "I was just getting older. I saved all my money and I was happy with the money I got. Then I started teaching school in Chicago, physical education." It was in latter part of the 1970s when Lanny Poffo was old enough to wrestle, when Angelo purchased a share of AGPW in the Canadian Maritimes with Emile Dupree. Angelo also wrestled there under a yellow mask featuring a dollar sign on the forehead. He called himself The Carpet Bagger. Angelo Poffo's most well known contribution to the business in the eyes of modern fans, other than his children, may be his ownership of the outlaw promotion, International Championship Wrestling, based out of Lexington, Kentucky. Again this promotion was his way of getting Lanny and now Randy too, recognized in the wrestling world. Poffo is remembered as somewhat tight when it came to money as a promoter. During this time Angelo continued to wrestle, but with nowhere near the same amount of regularity as he once had. He continued to wrestle all through-out the first half of the 1980s semi-regularly, following 1985 his matches became rather sporadic. They usually were compromised of him teaming with one of his sons or someone else close to the family. In the year of 1991 Angelo Poffo faced Luis Martinez in his final singles match. Following that he wrestled a couple more times with his sons, but that is generally considered his retirement match. His final appearances for a wrestling promotion happened during 1995 when WCW inducted him into their Hall of Fame. On March 3, 2010 Angelo Poffo passed away. By old-school fans he will be remembered as a wonderfully villainous heel and ballsy promoter running his own outlaw promotion. By new-school fans he will be remembered as the father of "Leaping" Lanny Poffo also known as the Genius and arguably one of the greatest sports entertainers of all time, "Macho Man" Randy Savage. And the World's Greatest Dad!"